A Japanese company on Wednesday filed suit against Apple for allegedly infringing on a U.S. trademark covering "Animoji," which the Cupertino tech giant is using to market a new facial recognition feature introduced with iPhone X.
App Store screenshot showing an early version of emonster's Animoji app. In a complaint lodged with the U.S. District Court for the Northern District of California, plaintiffs emonster k.k. and Enrique Bonansea, a U.S. citizen living in Japan, registered for the "Animoji" mark in 2014, reports The Recorder. The U.S. Patent and Trademark Office subsequently granted rights to the property in 2015. Emonster, a software development firm based out of Tokyo, applied the mark to a titular app that hit the iOS App Store on July 23, 2014. 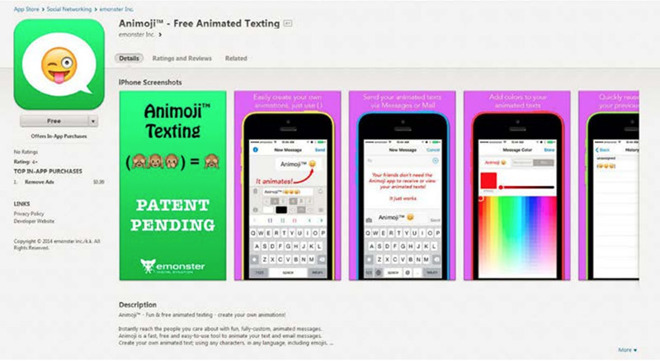 Still available for $0.99, Animoji - Free Animated Texting [Patent Pending] is described as a "fast, free and easy-to-use tool to animate your text and email messages." The app provides basic animated emoji graphics for embedding in iMessage or email text. Unlike similar features rolled out by other messaging services, moving graphics sent by Animoji can be viewed by anyone, even users who do not have the app installed. According to the complaint, Apple not only had knowledge of the Animoji app prior to September's iPhone X launch, but attempted to purchase rights for the mark from emonster. Bonansea claims he was approached by Apple "fronts," like The Emoji Law Group LLC., to sell the property this past summer. These entities allegedly threatened to file a cancellation proceeding if the developer failed to acquiesce to their requests. The suit does not include evidence that ties Apple to the supposed fronts, but the iPhone maker has been known to conduct patent, trademark and other publicly accessible regulatory operations under the guise of shell corporations to avoid unintentional leaks. "Instead of using the creativity on which Apple developed its worldwide reputation, Apple simply plucked the name from a developer on its own App Store," the complaint reads. "Apple could have changed its desired name prior to its announcement when it realized Plaintiffs already used ANIMOJI for their own product. Yet Apple made the conscious decision to try to pilfer the name for itself — regardless of the consequences." Apple filed for a cancellation of the "Animoji" trademark one day prior to announcing the highlight iPhone X feature at a special event in September. As noted by Apple, the Washington company "emonster Inc." did not exist at the time of the original trademark filing. Bonansea lived in Seattle prior to moving to Japan. The suit points out, however, that the now dissolved "emonster Inc." and current Japanese corporation, "emonster k.k.," acted as a single commercial enterprise when the mark was first filed. As such, emonster's USPTO counsel filed for a technical correction to clarify correct ownership, but that attempt was rebuffed as the cancellation proceeding was already underway. Plaintiffs reapplied for "Animoji" on Sep. 12, 2017, this time through emonster k.k., using the app's 2014 launch data as a basis of registration. Apple announced Animoji alongside its next-generation iPhone X handset last month. Presented as a key feature that shows off the smartphone's TrueDepth camera system and advanced iOS 11 software, Animoji are emoji characters that animate based on a user's facial expressions. The fun messaging feature is actually quite complex, relying on computer vision and processing technology likely developed through acquisitions like real-time motion capture specialist Faceshift and facial expression analysis firm Emotient. Emonster and Bonansea seek a permanent injunction against Apple's use of "Animoji," damages, profits attributable to the mark and court fees.